Mapleton’s Organic prepares delicious dairy milk products that are crafted on the family farm since 1999. All Mapleton’s products are made using organic milk form their herd. The family farm is located in the quiet Wellington County, Ontario. The farm now consists of 400 acres of certified organic land and a herd of 70 milking cows producing 600,000L used for Mapleton’s products annually. ice cream cookies and frozen yogurt. 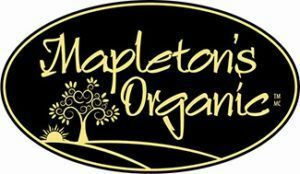 Enjoy the fresh taste of Mapleton’s Organic!